As a child growing up in segregated Texarkana, TX, Dr. LaRuth Gray found the arts to be her “window to the world.” If sitting in the back of the bus restricted her movement, she learned she could go anywhere and everywhere through the arts. 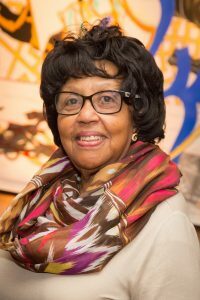 This simple understanding propelled her to a lifetime of leadership in the arts, equity and social justice as an educator and public policy innovator. Now she serves as scholar in residence at New York University’s Steinhardt School of Culture, Education and Human Development’s Metropolitan Center for Research on Equity and the Transformation of Schools. Most importantly, she has had an illustrious career in many important “change agent” positions. These positions include but are not limited to: Superintendent of the Abbot Union Free District, Affiliate Professor at NYU, Deputy Director of the Metro Center and membership on numerous boards that serve education and/or the arts. As former President and a board member of ArtsWestchester for more than 25 years, she has helped the organization plan and implement a vigorous inclusivity agenda. In recognition of her effectiveness as a leader and devotion to the rights and wellbeing of others, Dr. Gray will be given The Leadership Award at the Arts Award Luncheon on Wednesday, April 11th at the Westchester Country Club in Rye. Bravo LaRuth! For tickets and information on the Arts Award luncheon, click here.